Bojangles’ Inc. [NASDAQ:BOJA] announced on March 6 its 2017 fourth quarter and annual results. For 2017 franchised same-restaurant sales were down 1.1 percent compared to 2016. Same-restaurant sales is a key metric for restaurants. In the chicken chain's fourth quarter, comparable sales for its franchises dropped 2.2 percent. Bojangles' is losing customers as well. Customer visits to Bojangles' restaurants were down in 2017 compared to 2016, which contributed to the drop in same-restaurant sales. “Our transactions were about 6 percent negative,” said the CFO about 2017 results at a March 6 earnings conference call for stock analysts. John Jordan mentioned that there was a consolidation of franchises from stronger franchise owners who were buying out weaker franchises. In the CFO’s view, franchised businesses that are EBITDA positive (earnings before interest, taxes, depreciation and amortization—a sort of measure of cash flow, after those items are added back to net profit) are investing their equity into buying troubled stores that are EBITDA negative. In other words, strong franchisees were using their recipe for success to turn distressed stores around. It should be noted that larger multi-unit franchisees can have better margins than smaller mom and pop franchises by consolidating and cutting administration and overhead costs. Bojangles' plans to sell off some of its 325 company-owned restaurants (that count is as of December 31, 2017) to franchises. “We hope to refranchise more company operated restaurants over time and as part of that process we expect there will be some store closures as well,” said the CFO. The franchisor has been experimenting with store designs. “What we have learned is our costs have gone up a lot relative to getting the building constructed and opened. And so one of the things we are going to really have to home in and focus on is bring those costs down,” said Jordan. “There may be some smaller stores that we build, smaller square feet,” said Jordan of future 2018 store models. 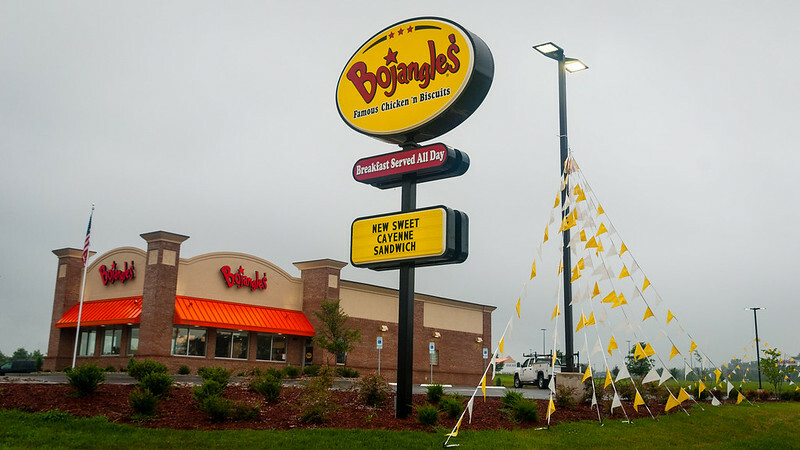 Besides declining visits and restaurant-level sales, Bojangles' had some initial bad news for investors and franchisees of the resignation of its CEO. The chief executive officer of Bojangles', Clifton Rutledge, stepped down on March 5, a day before the company released its annual and last quarterly report for 2017. Former chief executive James “Randy” Kibler, who had been president of Bojangles' from 2011 to 2014, as well as its CEO from July 2013 to January 2014, and is presently a member of the board of directors, was appointed the firm’s interim president and CEO. Good news for Bojangles' Inc. The good news for the franchisor was that after an initial plunge in share price on the news of the CEO’s departure, Bojangles' stock rallied. That is because Bojangles’ Inc. reported earnings per share of 23 cents, which was higher than the expected 16 cents a share projected by a consensus of six stock analysts. Bojangles’ revenues from franchise royalties increased 11.3 percent in the last quarter of 2017 from the $6.8 million taken in during the same quarter in 2016. That was one of the benefits to the franchisor in selling more franchised restaurants. “The increase reflects a net additional 32 franchised restaurants on a year-over-year basis,” said Jordan. “These were partially offset by the decrease in franchised comparable restaurant sales,” he added. In 2018 the chain expects to see an inflation rate of 2 percent in food commodities. Labor costs will go up too. The CFO also projected that same-restaurant sales in 2018 for company-owned and franchise restaurants compared to 2017 will continue to be in the negative low single digits. In this tough environment Bojangles' plans to slow down its rate of growth of its own company-owned restaurants. It plans to grow more by franchising. Jordan then added a warning to the listening analysts about restaurant closures for them to factor into their expectations, which franchise owners as well should be mindful of. “Closures of underperforming company-operated and franchised restaurants during fiscal 2018 and potentially subsequent years could exceed those of recent years,” said Jordan. Bojangles' expects to open 24 to 30 franchised restaurants in 2018, but also plans to terminate a number of underperforming franchises. It's always amazing to me how franchisors minimize how their franchisees have been impacted. They only had declining sales of 2.2%. We all know the profit is on our top dollars, so that 2.2% loss on sales, plus ongoing increased costs (food costs, rents, electricity, etc), probably meant a profit decline of 6-10%. Doesn't sound so small now, does it? But don't worry, franchisor revenues increased, the stock price has gone up, so all is good.